Automobile continues to evolve such as automated driving, energy saving, ecology and safety. And also, the automotive industry has a broad base with supply chain from the top, the completed automobile manufacturers to the first supplier, to the second, to the third… across a wide range of categories. In each category, they severely pursue functionality, efficiency, simplification, and cost reduction. By gathering those factors, high levels of competitiveness is generated among automobile manufacturers in Japan. One of what makes these possible and supports them is high dimensional machine tools and metal cutting technology. We always pursue new, more efficient machining methods to produce excellent products together with completed automotive manufacturers and components suppliers. Regarding metal cutting, we require high-levels of proposals. 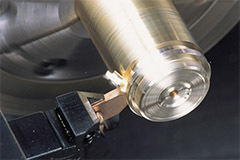 To do so, cutting tools and methods are required to develop. Gifu Shoji accumulated knowledge and methods to win competitions by proposals of high-efficient and low-cost cutting method. In order to respond to strictly required accuracy in the automotive industry that leads the world, Gifu Shoji continues to accumulate sufficient know-hows.